The president of the European Federation of Journalists Mogens Blicher Bjerregård is attending today in Istanbul the opening of the trial of 17 journalists and executives at Turkish opposition newspaper Cumhuriyet. “Journalism is not a crime,” chanted several hundred people gathered outside the central Istanbul court to protest against the prosecution of journalists, executives and lawyers of Cumhuriyet. “Representatives from international free expression groups and professional organizations are here today to observe proceedings in this trial and send a message of solidarity – to the journalists on trial, to their families and colleagues, and to all journalists in Turkey. We are here from the International Press Institute, Reporters Without Borders, the European and International Federations of Journalists, the European Centre for Press and Media Freedom, PEN International, and its branches in Norway, Belgium, Switzerland and Italy, and the Netherlands, and the International Publishers Association. We are also here to send a message to Turkey’s government: the world is watching. And attempts, like this case, to trample on human rights, to silence criticism, to stifle dissent and avoid accountability, will be neither ignored nor accepted. This case is about criminalizing journalism. It’s about punishing those who speak out. And if it works here, they will do it again. And again. And again. 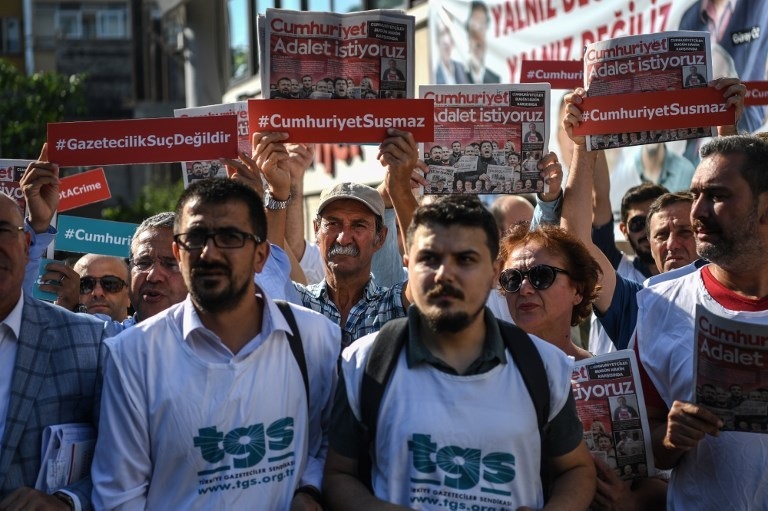 This trial will decide far more than the fate of 17 Cumhuriyet journalists and executives. It will show whether journalism and human rights, and the rule of law – even democracy itself – have a place in this “new Turkey”. They must. A free, stable and prosperous Turkey depends on it. Pictures credit: Ozan Kose / AFP.